Happy Monday! I’m excited to introduce a new indie brand to Lacquertude.com – please welcome Delush Polish! Adrianna, the creator and owner of the brand has just celebrated her one year brand anniversary. I personally ADORE the deliciously-delushy glitter polishes that are signature to her collections so far. I have the first 3 of her Spring Awakening Collection and let me just say that I believe these cute and colorful polishes would be great to wear from now and through the summer. Let’s take a look at the photos! The first 3 that I chose as Part I of this collection are hands down my favorites! I happen to have these beautiful flowers on hand and thought the colors echo beautifully with these shades. It’s so fresh, so spring, and so cheery! A few words regarding the formula of this collection: since they’re all glitter packed, the consistency seemed a bit thick to me. It didn’t affect application and every shade reached full opacity in 2 coats for me. However, it’s worth mentioning that because of the myriad of glitters in each bottle, the finish of the whole line tends to be slightly rough. If you prefer smooth nails like I generally do (one reason you’ve yet to see me swatch or review any texture polishes), then you’ll want to apply 1-2 generous coats of top coat. Also, I’m not sure about the type of suspension base used, but the glitters settled on the bottom while the collection waited for its swatch turn. So, I’d recommend storing them upside down for a few hours before wear. 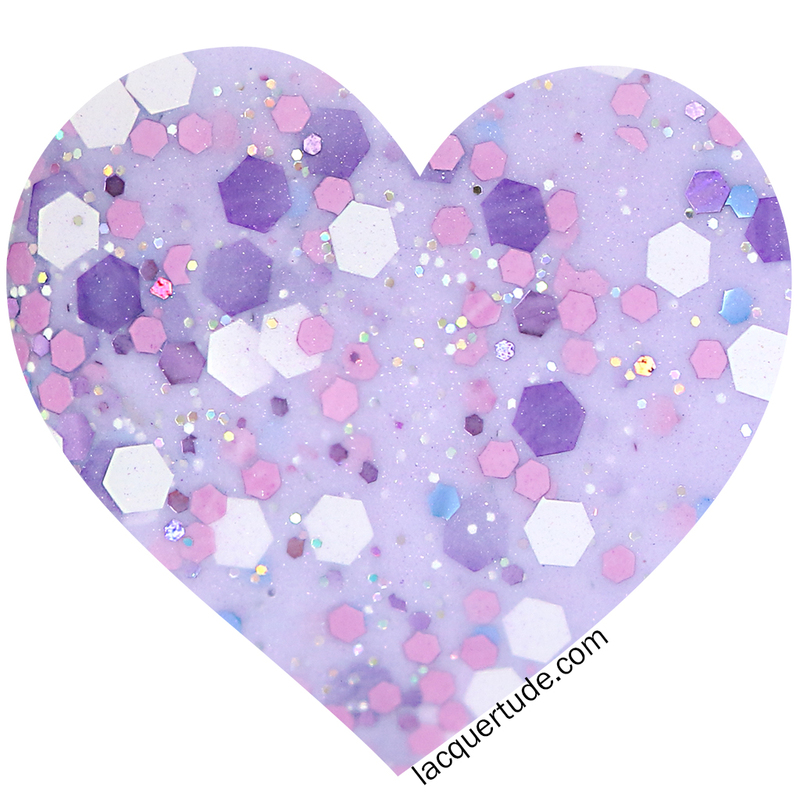 Destined For Grapeness has a sweet lilac base filled with holographic shimmer and micro glitter, pink, blue, white and purple hex glitters. For this whole collection, I’m really impressed with the color combinations of glitters in each shade. They’re harmonious, pretty, and with just the right touch of fun! This was opaque in 2 easy coats. I did place a couple of larger white and purple hex glitters because I’m a bit of a control freak. But, overall, as long as you store the bottles upside down for a while, you shouldn’t need to fish for the glitters when you’re ready to paint your nails. Ok, maybe this is a bit cheesy, but I just couldn’t help myself but to include heart shaped color swatches for the collection as a nod to the heart in the Delush logo. Plus, it shows off the texture wonderfully, don’t you think? Basket Case really stole my heart. It’s sooooooo cute with the creamy off white crelly base and the glitters in an abundant variety of colors and shapes. I see blue, yellow, red, and neon green (OH I’m IN LOVE!) 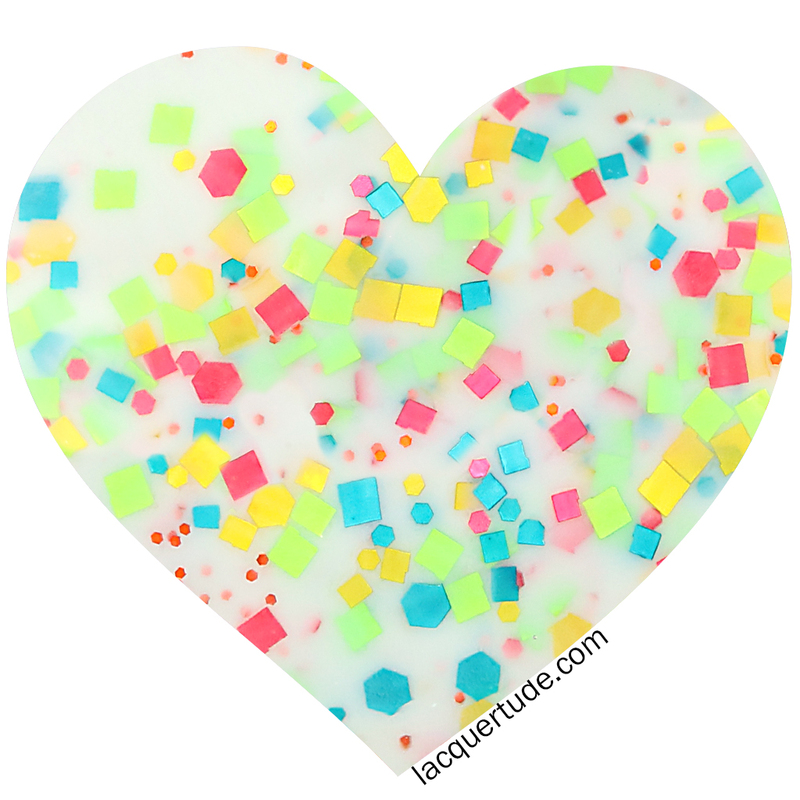 glitters in at least 3 different sizes of hex and square shapes. 2 coats here. Medusa’s Verde has a shimmery soft green base filled with round gold glitters and various sizes of hex glitters in blue, gold, and green. 2 coats to opacity and it finished mostly smooth. The texture created by the different kinds of glitter is complex yet perfectly cohesive. I love those tiny bright blue glitters! 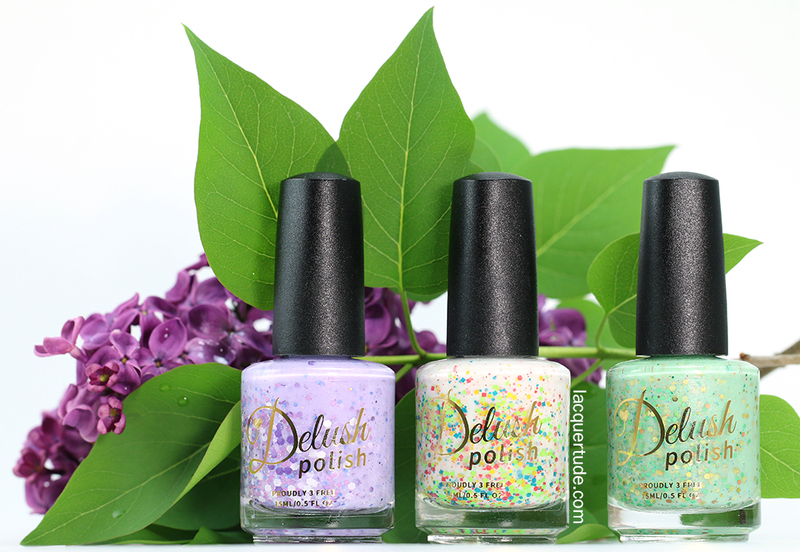 I hope you enjoyed my swatches of PART I of the Delush Polish Spring Awakening Collection. Part II will follow shortly. I think they are unique and absolutely delicious. What do you think? You can purchase her full 15 ML bottles for $8.95 USD and mini 8ML bottles for $4.50 USD here. I’d say her price point is very fair. Have a wonderful week and I’ll see you very soon! I am in love with Basket Case. I love white crellies with matte glitter, and this one is just perfection! 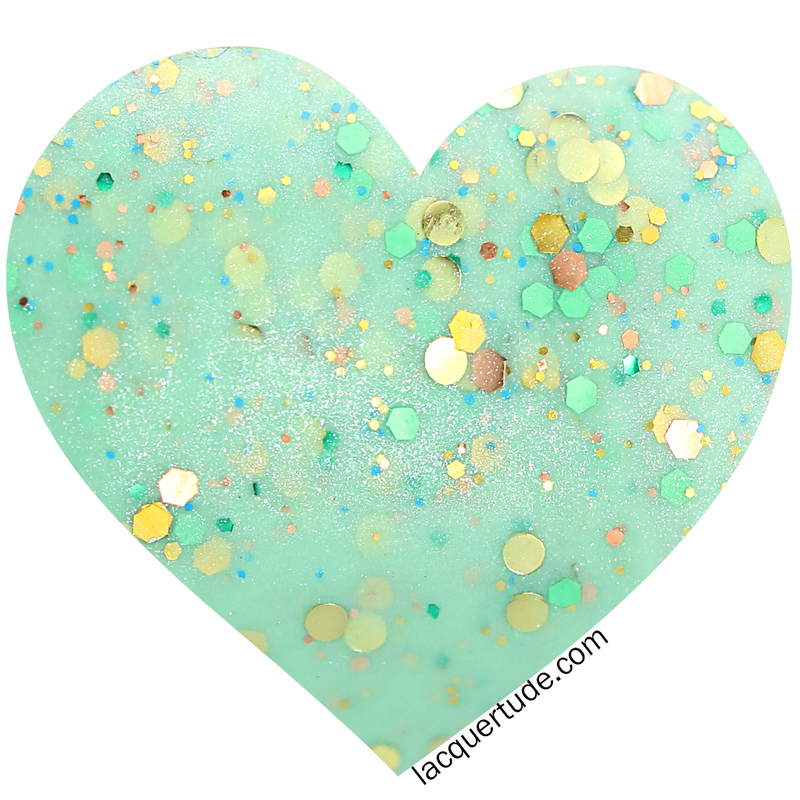 lol, and such fun – love that neon green glitter amongst the other colors of glitter. Thank you sweetie! I agree, Medusa’s Verde’s such a sweet green.